Ex-Bertha: still up in the air! Even in her hey-day Hurricane Bertha was not a powerful or well organised storm and she disappeared as a discrete tropical storm a few days ago. What is left crossing the Atlantic is a significant “blob” of heat and moisture that she dragged into the dog-days of the mid-latitudes. Unfortunately for meteorologists the energy injected “intravenously” into the mid-latitudes upsets super-computer weather model forecasts. Models cannot handle the excitement! The result is that various weather forecasts have struggled to agree and have been producing significantly differing outcomes as to the strength of Bertha and to when, where and IF she “makes landfall” in the UK. Usually, the differences in model forecasts gradually reduce and forecasts increasingly agree, but in volatile atmospheric conditions it often goes down to the wire, like on this occasion! This is why meteorologists have been unable to confidently pin down the exact track and strength and impact of Bertha on the UK. Today there remains uncertainty, despite being only 48 hours out from her arrival. The main cause of uncertainty is how she eventually interacts with an unseasonably strong and southerly jetstream. Where a low pressure like Bertha arrives and moves under a jetstream makes a big difference to where she goes and whether she strengthens or weakens. The so-called “left-exit” region of a jet exerts most influence on deepening low pressures into significant storms. Where the jet is slowing down or speeding up or curving can create extra lift, dragging air off the surface causing pressure to drop. 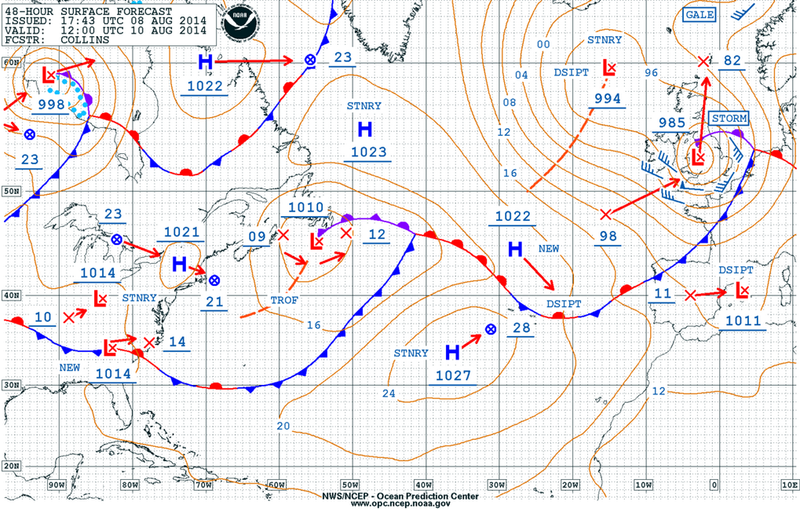 #1 Bertha could travel more or less down the eye through the English Channel from the SW. This would take most of her highest winds and gales through France but would clip the south and SE of England with some heavy rain as the low crosses directly over this area. The highest winds in these tight LOW pressure systems usually occur to the south of the LOW centre, associated with the warm and cold fronts. The heaviest rainfall is modelled to fall to the north of the low associated with the occluded fronts and low pressure centre, hence the heavy rain clipping South and SE England. This outcome is currently favoured by the BBC and UKMET office models. #2 Various other models, the GFS and WRF-NMM amongst them, favour a more northerly route and take the LOW from the SW approaches, through St George’s Channel, across Wales and into the heart of England before exiting into the North Sea. Broadly speaking, this would be a worst-case scenario because the UK would take the brunt of both heaviest rain (to the north) and the highest winds (to the south). Nevertheless, for @ridelondon and #Reigate and the SE this might be the preferred route because any fronts and poor weather would pass over our area relatively quickly on Sunday, the worst of it probably from around 9am through to 2pm. It would also leave only trailing fronts depositing up to 10mm or so of rain across our region and some gusty conditions, wet for a while but nothing too drastic to speak of really. #3 A third model, the ECMWF has, until recent runs been quite the outlier amongst all competing tracks, sending Bertha further south through France in earlier runs. More recent ECM runs have played catch-up with GFS and now sends the LOW NE through the UK. 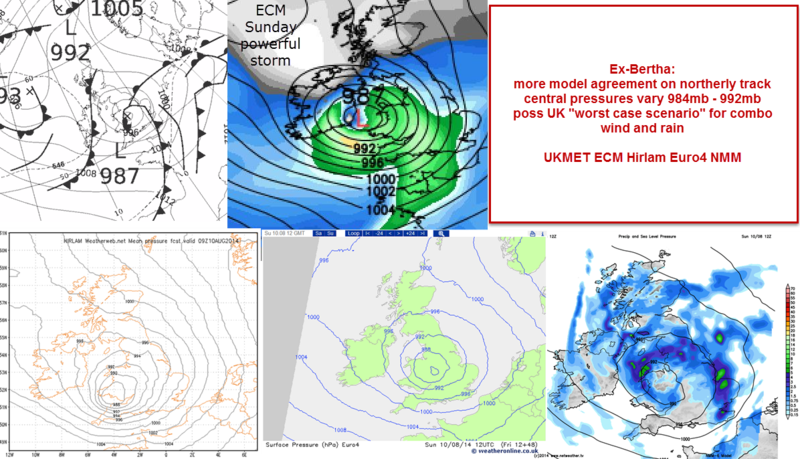 Significantly, ECM drops pressure to 987mb in the Irish Sea. The outcome could, of course, be somewhere in between these two or something totally unexpected! It is worth also pointing out that extra-tropical storms arriving in the UK are not uncommon and this one is likely to underwhelm in many places inland where gusts are unlikely to exceed 40mph and, in the SE maybe 30mph gusts will be the widespread maximum. Coasts, hills and exposed areas are likely to see the worst of it with gusts up to 60mph or more. Even here it will not be anything like as potent as our storms last winter where winds exceeded 90mph on occasions. Nevertheless, with leaves on the trees there may be some blow-downs and loose branches and rain in some places might disrupt travel but it is doubtful that wide-spread chaos will ensue as compared with the morning after St Jude last October which was a lot more potent. See below. The best advice is to watch weather warnings and updates carefully on Sunday for any changes. RGSweather will be posting NOWCAST updates on twitter for Reigate and environs. Here is the latest from NWS/NCEP showing storm force winds in the sea around the UK, note the unseasonably LOW central pressure on 985mb. In comparison, St Jude storm had a lowest overland central pressure of 976mb back in October 2013. Interestingly, the longer term weather impact of Bertha into next week is probably better modeled than her immediate track on Sunday. She is forecast to move slowly up the North Sea and merge with and deepen her “parent” LOW to the N of Scotland. This will introduce cooler unstable showery NW winds to the UK for the early part of next week. Showers and some more organised bands of rain are likely to be frequent visitors, especially to the NW and west coast. It will also feel cooler and more breezy for the whole country. So, put the balmy warm days of summer on hold next week. More model agreement now on a northerly track. Potential for UK worst-case scenario. Wind and rain crossing the country. Inland 30-40mph, coastal and hills poss 50-60mph.